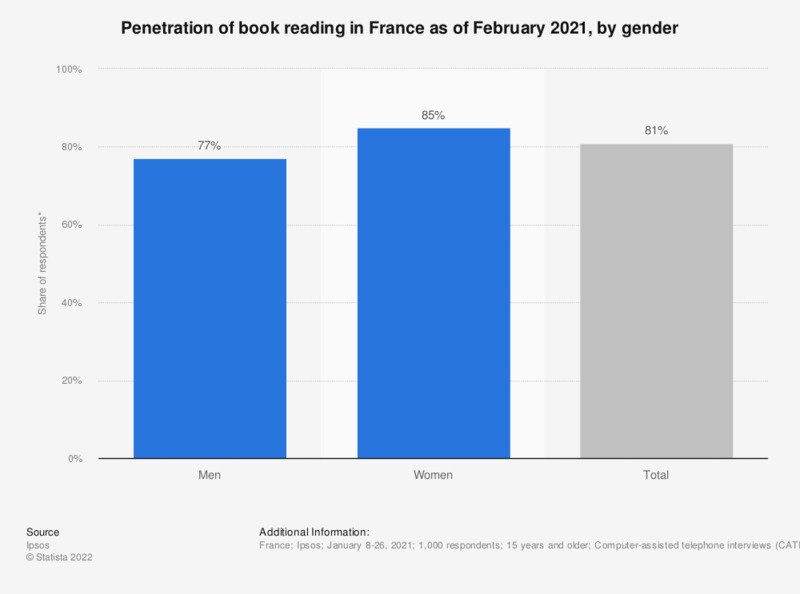 This statistic displays the share of people in France who have read a book in the twelve months previous to a survey which took place in January 2017, by gender. It reveals that 93 percent of women respondents had read a book in the last twelve months, against 89 percent of men. * This statistic shows the share of individuals who read at least one of the book genres mentioned by the source during the 12 months previous to survey. "Among the following book genres, which ones have you read during the last 12 months, whether it be a print book or in digital format: French or foreign classic litterature (until the 20th century), spy or crime novels, fantasy, heroic-fantasy, science fiction or horror novels, sentimental novels, other novel genres, poetry, historic books, self-help books, psychology books, news reportage books, children books, mangas, comics, comic strips, art books, photography books, political, philosophical or religious essays, books about cooking, decorating, handy work, travels, etc., scientific, technical or professional books, dictionaries, encyclopedias or any other kind of book." Which are the two main purposes of the school library?